The Borg Warner Overdrive Transmission began its life in the 1930s and was last used anywhere in the automotive industry in Ford trucks in 1972. Overdrive was last used in Ford passenger cars in 1967. 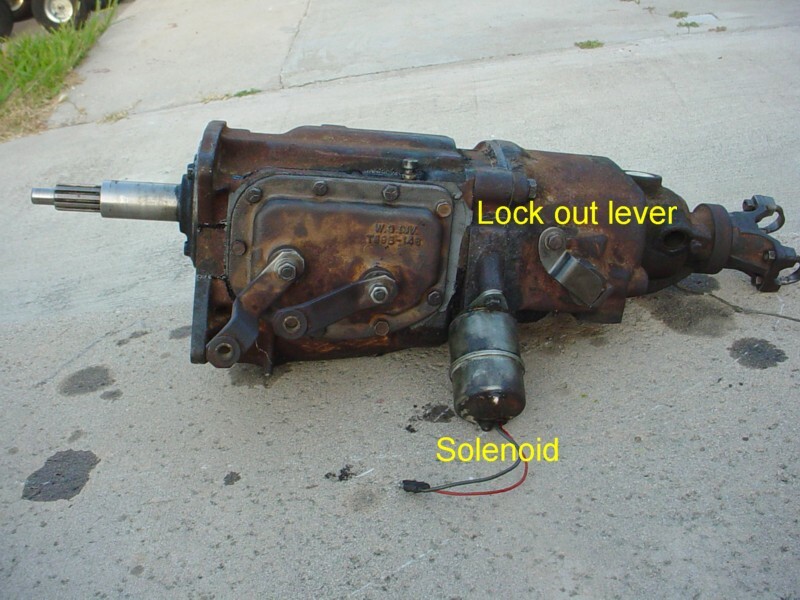 This article is to explain this unique transmission and its features to Ford truck owners & enthusiasts in the hopes that they will have a better understanding of how fortunate they are to have acquired one and better understand how to operate, repair, and enjoy it. Popularity of the B-W OD lessened over its long production life, especially after availability of fully automatic transmissions, but it still remains the most versatile transmission ever put into a vehicle. However, to maximize its full operating potential, the driver must understand what it does and how it works. Unfortunately the chances of a 21st-century truck buyer who might be lucky enough to come across an overdrive-equipped Ford truck appreciating how lucky a find they have diminishes every year. It then becomes ever more likely that the marvelous overdrive set up would be removed and the truck converted to another transmission type...a sad loss indeed. There are many ways to “overdrive” a vehicle. To overdrive something is to gear it in such a manner that more revolutions come out of a gear set (the transmission) than went into it. Overdriving a running gear (motor, transmission & axle combination) lowers the revolutions that the engine spins at any set speed, but overdriving also exchanges this lower engine speed for less of a mechanical advantage - less able to pull away from a stop, the less able to pull a load, the less able to pull a hill. In the simplest terms, overdrive acts like a super-high gear that is intended to be used only at freeway speeds to lower the engine revolutions, lower engine wear and lower both engine oil and fuel consumption. Overdriving a vehicle can be done in many ways, such as adding an additional entire transmission (like a Brownie auxiliary transmission) or adding an additional ‘gear’ to the existing transmission (like modern five-speed transmissions, where 5th gear is overdrive). An overdrive ratio can also be created with a planetary gear set. (This is how a Borg-Warner OD transmission accomplishes an overdrive ratio). A planetary gear set is what exists in most automatic transmissions. You can read elsewhere about how the holding and releasing of the sun, planet and ring gears give various ratios, but for the purpose of understanding how a B-W OD system works all that needs to be remembered is that when the sun gear is held and the planets are driven by the transmission the output shaft, then more revolutions are sent to the driveshaft than went into the transmission. Holding and releasing the sun gear is all it takes to make a B-W OD transmission go into and out of overdrive. The B-W OD transmission originated during the 1930s to solve a number of problems that existed on cars at that time. It uses a freewheeling clutch that began life in the 1920s and later added a planetary gear set (operated as a purely mechanical device in the early 30s) and eventually finalized the design by using electrical components to operate the system by the late 1930s. Most every automotive manufacture offered the B-W OD set up as an option on their cars at one time during their production life. Manufacturers who focused their marketing toward operating economy were all heavy promoters of the B-W overdrive. Studebaker probably made more OD-equipped vehicles than anybody. Other AMC marques (Hudson, Rambler, Nash) were also big users. Ford first offered the Borg-Warner OD on Lincoln Zephyrs beginning in 1941. Fords and Mercurys received the B-W OD as an option in 1949 and the F-series trucks got OD for 1953. (Before 1941 & 1949 Ford, Lincoln & Mercury used a two speed axle to lower engine revolutions – The Columbia axle - not discussed here). To understand the B-W OD, the features it has and how to properly drive it, one needs to understand the driving conditions that existed during the 1930s & 40s. At that time all vehicles were operated by a low horsepower (80-100HP) low compression engine, with a very long stroke (4+ inches would not be unusual). This engine design is very appropriate for in town driving conditions. (start & stop, no hills and speeds that do not exceed 40 mph). To make it possible for a low power 1930s-40s engine to climb hills and haul loads manufactures installed very low rear axle ratios. (High numerically) 4:10+ was common and some vehicles approached and sometimes exceeded a 5:1 ratio. These ratios made it possible to climb a hill (road building technology was equally behind 21st century techniques, grades were steeper back then) but would also spin an engine very fast at highway speeds. (60 mph was exceptionally fast in 1940!) Overdrive transmissions made modern freeway speeds possible while saving gas, oil and engines. (Thrown rods were common in the 1930s & 40s). A Borg-Warner OD has sometimes been called a ‘cable-operated’ overdrive...IT IS NOT! A B-W OD is electrically operated. The only control visible to the driver is a cable located somewhere on the dashboard. However all this cable does is ‘lock out’ the entire system. When the knob/cable is pulled out the transmission operates entirely as a standard three-speed transmission. With a properly-operating system and knowledgeable driver, the cable will be pushed in 90% of the time. When the OD cable IS pushed in, the first operating feature of the B-W OD transmission becomes apparent it “freewheels”. This means that while the engine can drive the wheels, when the vehicle coasts, no power is fed back to the engine. No engine braking, just coasting. When the electrical components of a B-W OD are not functioning this is all that the transmission will do - freewheel. Freewheeling at speed is dangerous and can lead to loss of control due to increased brake use. However a properly functioning B-W OD does NOT freewheel at speeds above 28 mph. In a properly functioning OD engine braking DOES happen. The thought that engine braking is not possible is a major misconception for a B-W OD transmission. 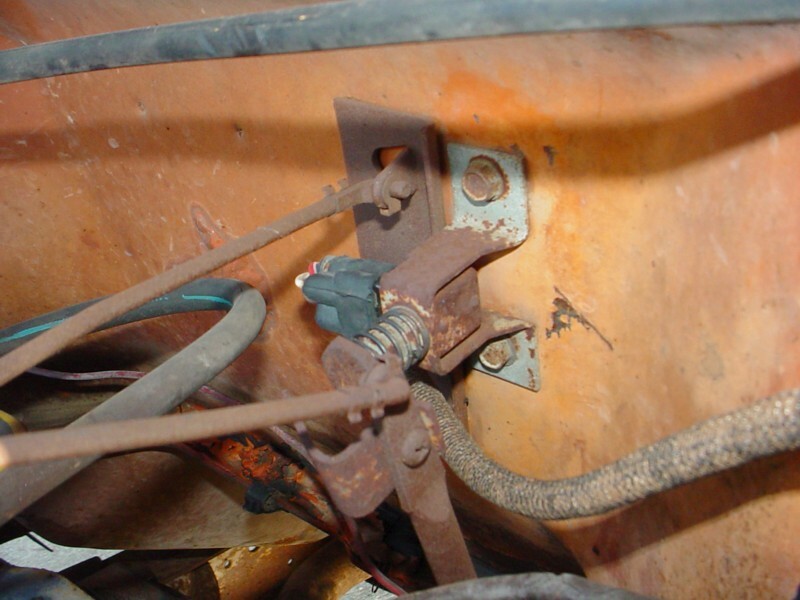 The other operating control for a B-W OD transmission is not readily visible to the driver (and not visible at all from the driver’s seat of a 67-72 Ford truck) it is the kick down switch. 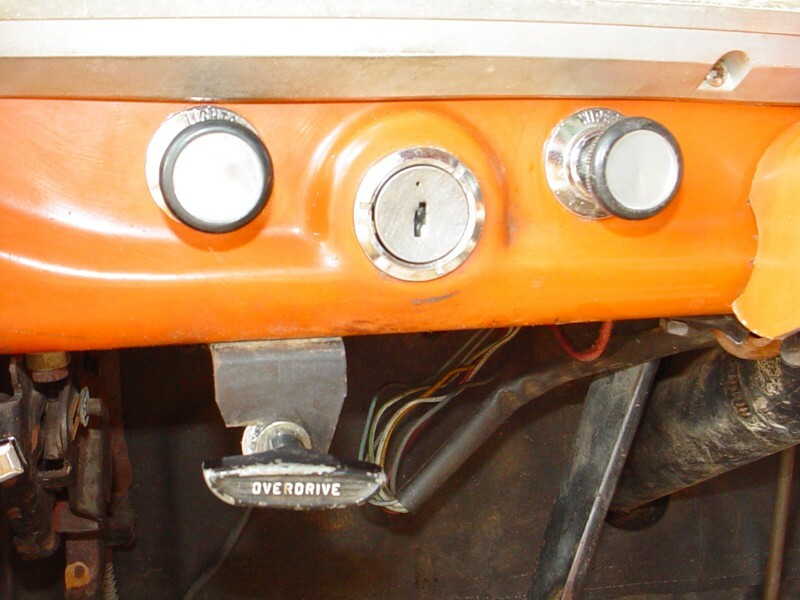 The kick down switch is a push button type switch that is operated only when the accelerator is fully depressed (mashed to the floor) Before 1967, Ford trucks used a switch design that goes all the way back to the 1930s. It protruded through a hole in the floor and was activated by the back of the gas pedal. Starting in 1967 (1963 for cars) the kick down switch migrated to the firewall and was operated by the throttle linkage. Driving a B-W OD vehicle starts off with the cable pushed in and the truck pulling away in first gear as normal. The truck accelerates and the driver shifts into second gear. At approximately 28 mph (BTW - nobody knows why 28 mph and not 25 or 30 mph) a small click can sometimes be heard from under the hood (activation of the relay on the firewall by the governor on the transmission) the driver then backs off on the gas and the transmission automatically shifts into overdrive. The shift feels exactly like a shift from an automatic transmission. The driver must release the accelerator completely such that the power comes back from the wheels toward the engine to complete the shift to OD. In an automatic transmission a shift will occur (eventually) even if the throttle is held open. For mechanical design reasons in a B-W OD set up, the driver MUST let off the throttle completely to allow the shift to happen. With the vehicle in second gear overdrive, the overall ratio is not quite as high as third, but higher than second. This is a perfect ratio for in town use. Between stoplights you don’t need to shift into third. However, if you continue accelerating and shift into third (from 2nd OD) and you will then be in third gear overdrive, the perfect ratio for the highway. An often asked question is “Can you overdrive first gear?” The answer is yes, however you would have to exceed 28 mph for the system to activate. The real question then becomes ‘Can you exceed 28 mph in first?’ 28 mph is pretty fast for first gear so 1st gear OD is rarely achieved. This means that while a B-W OD transmission has sometimes been called a ‘6 speed’ it is really provides only 5 practical forward ratios. While you are in overdrive if you back off the gas you will feel engine braking. (second or third) Because it is an overdrive ratio, the braking is not as evident as if the transmission were in 2nd or 3rd direct drive but the transmission does NOT coast. If the transmission does coast, the OD set up is not operating properly. Third gear OD is great for gliding along at highway speeds but it can lack power for passing or hill climbing. To get the transmission out of overdrive, mash the gas pedal to the floor. The engine will rev up and when the pedal compresses the kick down switch, it will suddenly and quickly shift back into direct drive. This shift feels exactly like the kick down of an automatic transmission. Complete your pass or top the hill in direct gear, then let off the gas completely for a moment and the transmission will shift back into overdrive. If you begin slowing down and shift from third OD to second OD, then slow down further as if approaching a stop light, as soon as the speed falls below 28 mph the power to the OD will be cut and the transmission will then be back in direct drive. This automatic loss of OD is a designed in safety feature because you must start out from a complete stop only in direct drive. To try to start out from a standing start in overdrive would create an incredible strain on the driveline is certain to damage something or at least result in increased clutch wear. Owners have sometimes rewired their systems and by-passed the governor by adding a manual switch to turn the system on & off. If this has been done it is very easy to forget and attempt to take off from a stop in first gear-overdrive. Doing this is as fool hardy as by-passing the neutral safety switch on an automatic transmission. So as you slow down below 28 mph you are automatically put back into second gear direct drive. HOWEVER, because the sun gear is no longer being held (no OD ratio) the transmission will freewheel. This event can be very surprising to someone who is not familiar with the operation of an OD transmission as suddenly there is NO engine braking! Since this occurs only below 28 mph there should not be much need for engine braking and using the foot brake to stop the truck should be just fine. But this is also where another novel aspect driving with a B-W OD transmission becomes apparent. All B-W OD transmission set ups (from all manufactures in all years) used a non-synchronized first gear. They never built a B-W OD transmission with a synchronized first gear. By the 1960s full syncro transmissions were fully available, so why didn’t they make a fully synchronized OD? Turns out a B-W OD trans doesn’t need to be synchronized! Drive in second gear OD, slow down below 28 mph and the trans falls out of OD and into freewheel mode. Step on the clutch and pull the lever into first and you will find it slips into first gear as easily as if it were synchronized! Even if you are rolling. This ‘synchro effect’ happens because the freewheeling clutch prevents power from being transmitted from the driveshaft into the transmission. Push in the clutch and there are NO forces on the gears. When you pull the lever into first gear it slips in easily. The most clashing you get when shifting into first gear at a rolling speed, is a slight “ratcheting” of the gear teeth that you would expect if you were shifting from neutral into the low granny gear of a truck 4 speed or the reverse gear in any transmission. The freewheeling feature also makes clutchless shifting possible. Start in first, pull away and then WITHOUT depressing the clutch pedal, back off the gas and shift into second as easily as if you had pushed the clutch! If you shift into third gear before 28 mph (and engaging the OD) again there is no need to depress the clutch pedal to make the shift. If however you have allowed the transmission to engage the OD in second (backing of the gas) then depressing the clutch is necessary to shift from 2nd to 3rd. These operational features are what made the B-W OD transmission very desirable in the days before fully automatic transmissions. (Especially with the ladies). No clashing shifts into first; No clutch necessary to shift into second; Automatic shift into second OD around town. One other aspect of the freewheeling clutch needs to be discussed; parking and pushing. Pulling out the OD cable on the dash operates a lever on the side of the transmission and mechanically locks the sun gear to the planetary gears. (Ideally the cable should only be pulled out while the vehicle is stopped). When the OD cable is pushed in then the whole system just freewheels. This happens as long as the vehicle is below 28 MPH (or the system has no electrical power) the OD will not engage. This means that to push start an OD equipped truck, the cable needs to be pulled out for the wheels to send power to the engine when the clutch is released. Parking is the other situation that pulling out the OD cable is necessary. If you park pointing downhill and put the shifter into first, second or third without pulling out the cable, the forward motion will freewheel over the engine and the truck will roll away. There is no compression lock. To overcome this you can either pull the OD cable out or place the shifter into reverse. In order for any OD transmission to back up, the freewheeling clutch MUST be locked out. There is a shaft/rod built into the transmission that automatically accomplishes this whenever the transmission is put into reverse. So to park safely (set the brake) and then either pull out the OD cable OR place the shifter into reverse. This locks up the driveline and prevents all rolling. Couple the OD transmission with the very low rear end gears that existed in the 30s & 40s and you effectively had an automatic transmission. Owners manuals from that time suggested that around town you could (should?) start out in second gear slipping the clutch only slightly, (possible with a very low rear end gearing) then letting the trans shift itself into second overdrive. No need to touch the lever and limited use of the clutch, what more could you ask for? Speaking of rear end gears how are they affected by the overdrive? All B-W ODs overdrive function at a 0.7 overdrive ratio. Since all transmissions use a 1:1 ratio in high gear, to find out your final drive ratio in OD simply multiply the rear end ratio by 0.7. Even a very low 4.56 ratio can be tamed by an OD into a very functional 3.19. This is what makes the B-W OD so appropriate for use in a truck. In a truck a low geared rear end could help it haul a heavy load but you don’t want to spin the engine so fast at highway speeds or when the truck is empty. With a functional OD you get the best of both worlds, strong low end pulling AND practical highway and unloaded use. An OD can also compensate for small diameter wheels & tires. Smaller wheels & tires spin an engine faster. 16” wheels turn the driveline slower than 15” which spin the driveline slower than 14” (as the wheels/tires get bigger they carry more weight and lower the engine speed but they also reduce the available power. All things are a compromise) All these factors need to be considered when outfitting a vehicle with a B-W OD transmission. If you use a rear axle ratio that is too high (numerically low) and/or couple it with wheels/tires that are too big in diameter a vehicle can actually slow down or use more fuel when it is operating in OD. The Borg-Warner overdrive transmission combines both mechanical and electrical components. The mechanical components are very stout and as long as the transmission AND THE OVERDRIVE unit is filled with gear oil (see maintenance below) the only problems should be electrical, which are very easy to trouble shoot. Take an OD truck out for a test drive with the OD cable pushed in, if it freewheels above 28 mph (and you don’t feel the automatic shift) the trans is OK but there is an electrical problem. The OD electrical system is protected by just one fuse clipped to the relay on the firewall. This fuse gets power whenever the key is turned on. Begin your diagnosis by checking for power at both sides of this fuse. Because the relay is under the hood, the fuse and its mounting gets very corroded, very easily. Remove the fuse, and clean all the contacts thoroughly. If there is no power here, trace the wire back to the key switch to find the break. If you have good power on both sides of the fuse on the OD relay, the next check is made under the vehicle. At the back of the transmission is the governor. This is a cylinder shaped device that is driven by the speedometer gear with ONE wire coming out of it. Inside the governor are weights that spin with the driveshaft. When they reach the magic speed of 28 mph, the wire going into the governor is grounded. The full circuit is that simple! For some reason the insulation on wire at the governor is always made from the same cloth used since the 1930s. This wire always seems to have a frayed spot. With the ignition key turned on, jump the wire to ground. 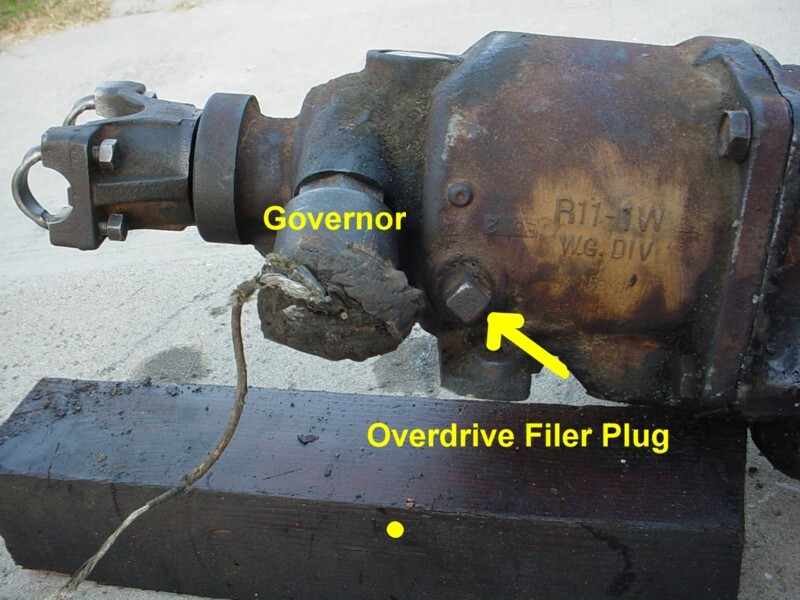 (There could also be a wire connector between the governor and the OD harness. Pull it apart and ground the wire that was going to the governor). However you ground the governor wire, you should then hear a click from the relay on the firewall. Power comes from the fuse through the relay, which is then activated whenever it is grounded. Power from the relay to the governor does pass through the kick down switch. If there is no relay click when grounding the governor, check for 12 volts at the wire and trace it back to the kick down switch and then back to the relay to find the open circuit. If you have 12 volts at the governor and you hear a relay click when you ground the governor, then the relay should be sending power down to the solenoid. (the steel can on the side of the trans) As soon as the solenoid gets power, it too should click. 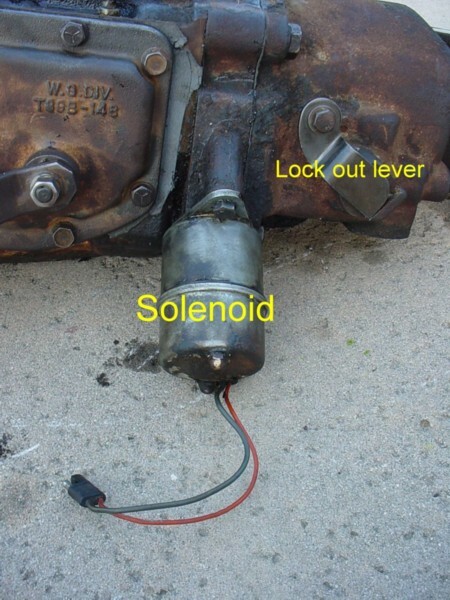 (the solenoid is trying to push its plunger shaft into the trans) If the solenoid does not click, check to see that it is receiving 12 volts of power directly from the relay. 90% of the time all the electrical problems are nothing more than loose and dirty connections. Remove the wire connections at the relay and the kick down switch and ensure that they are clean. I have had to sometimes spray the components with WD-40 and polish the contacts. Occasionally you might have to bend the tangs of the relay cover to gain access inside the relay to file its contact points, but this is rare. When the kick down switch was moved to the firewall it got away from the road splash and all the dirt on the floor that accumulates under the gas pedal and made them much more reliable. As an FYI all the electrical components for ALL Borg Warner OD transmissions are interchangeable. There are 6 & 12 volt versions and it seems like everybody used their own different types of wire connections, but once the connections and voltages match up, most any component will work in any system. (Some systems use a strange kick down switch at the carburetor but the basic function is all the same) So if you need a relay or solenoid you can use one from a Chevrolet, Rambler or Studebaker etc. Firewall mounted kick downs would generally have to come from a FoMoCo vehicle 1963 and up. Heavy mechanical repair of the transmission itself is too in depth for this article. As a quick test however, know that a transmission that freewheels can generally be made operational with an electrical repair. If the transmission does not freewheel (This can even be checked with the transmission out of the car) then it should be assumed that the overdrive compartment was not filled with 90 wt oil and the planetary gears are seized. It needs to go a transmission specialist for a rebuild. Maintenance of a Borg-Warner overdrive is easy. The mot important thing to know is that there are TWO places to add 90wt gear oil in the transmission. There is the normal plug/hole in the side of the transmission but ANOTHER plug/hole is in the tail shaft area. Fill both to the bottom of the hole with normal hypoid 90 wt gear oil as you would for any standard transmission. As discussed above clean connections are essential for the electrical system to function. I have a 1964 F-100 with 292 OD that I have used as a driver for over 25 years. In that time I find that I have had to pull things apart about every 4-5 years to clean the wiring connections. In a functional system you will find that you rarely need to pull the cable out while driving. You rarely ever need to lock out the system. 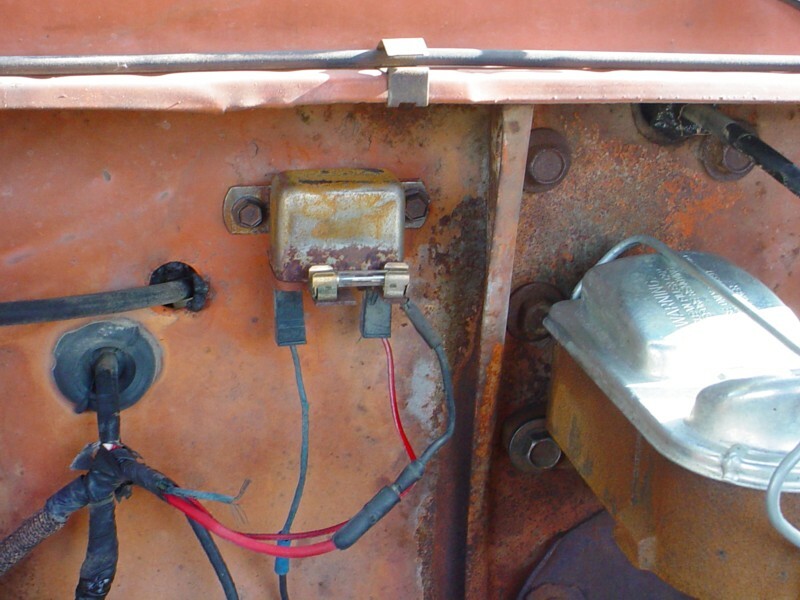 If you are restoring an OD equipped vehicle you will most likely find that the cable has not been used and is stuck. While they make replacements, the knob is not correct for 1967-72 trucks and you can generally free up yours with out much trouble. The cable must be removed completely to free it up. A big nut behind the cable secures it to the bracket under the dash. A 1/2” nut & bolt secures the functional cable end to the lock out lever on the transmission. 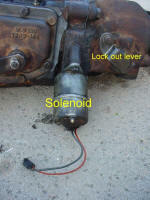 The upper bolt on the solenoid secures the bracket that holds the outer cable. 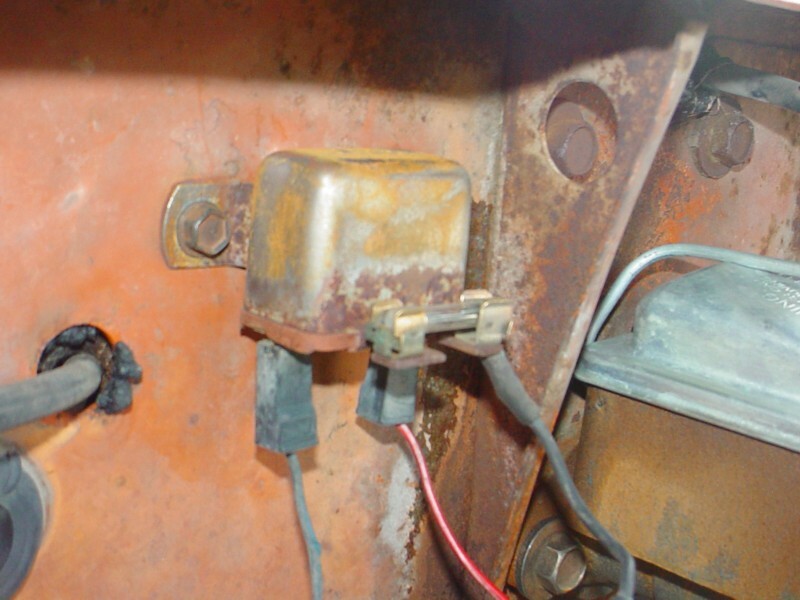 (Once unbolted, this sheet metal bracket is spread apart to remove it from the cable) Unbolt everything and pull the cable out through the firewall into the interior. By twisting the outer cable you should be able to break loose the inner cable enough to remove it. Use sandpaper to clean all the corrosion from the inner cable. Then use a wire wheel/brush to remove all the crud from the outer cable. Next insert the inner cable back into the outer sheave and spray the entire assembly with WD-40 or similar light oil. The outer cable is composed of wire tightly twisted around the inner cable. This design allows the oil to easily seep inside. Work it a bit and then it should move very easily. Overdrive can be added to any truck but you need to do it completely. A complete overdrive transmission must be used. It is NOT possible to add the overdrive component to an existing three speed transmission. The main reason you cannot add the OD parts to an existing 3 speed trans is the need for a shaft/rod to pass from the gear box into the OD unit to automatically lock out the OD freewheeling clutch whenever it is shifted into reverse. Only gearboxes designed to be fitted to an OD unit had this passage and internal linkage. Borg-Warner built OD units that used either 3 or 4 planetary gears. The 4 gear system is the strongest. It was identified as an R-11 unit. 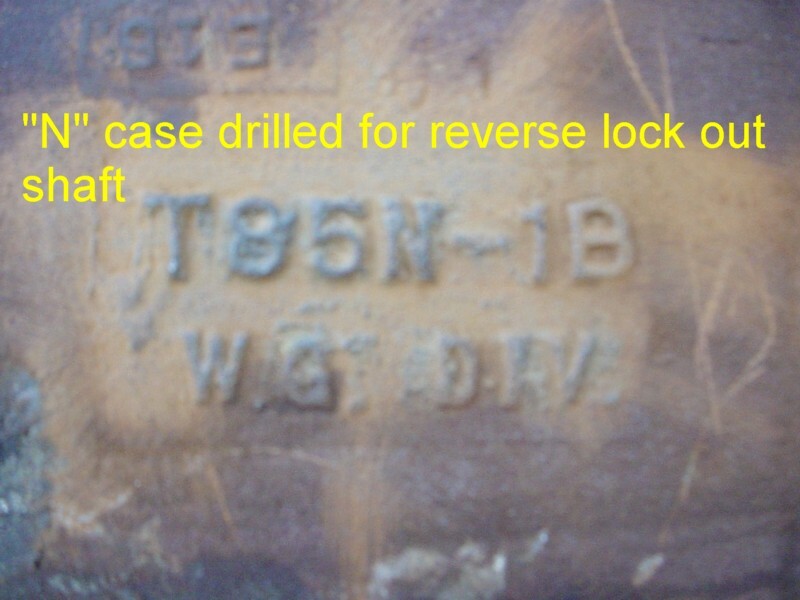 (see picture) These T-85/R-11 transmissions are strong enough that they were used behind the most powerful FE engines. Overdrive was offered behind the factory high performance 390s and 406s in 1961-2 and the mighty 427 of 1963-4. After the 4 speed became available in 1962 request for the OD transmission declined but it did function just as intended by taming the very low rear end ratios that were commonly installed in high-performance cars. The main difference between the transmission installed in a Ford car and truck is the design of the tail shaft. Cars used a one piece driveshaft with a slip yoke in the trans. Trucks used a two piece shaft with a yoke bolted to the output shaft. 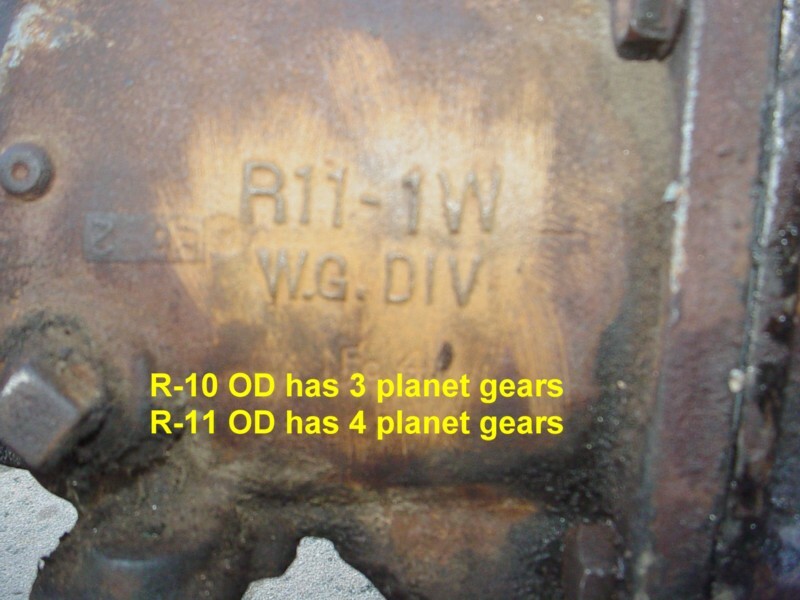 The OD gears and components are all identical. If you have a broken truck trans and good OD gears in a passenger car transmission a rebuilder can easily open up the OD unit and swap the necessary components to make a car trans into a truck version or vise versa. While it seems like it might be difficult to add or repair a factory type Borg-Warner overdrive system, once you learn how to use the system to its maximum potential and versatility you will find it well worth the effort.